Welcome back to another edition of Disney In Pictures! In this weeks edition, we are looking at some of our memorable pictures of Walt Disney World and it’s roller coasters! I have quite a few I hope you enjoy, so please come aboard for the ride! First up on our photographic journey is my wife’s favorite roller coaster: Space Mountain. Unfortunately for us, we haven’t ridden Space Mountain in many years, mainly because my daughter is not a fan of the ride, but that will change this summer! In this picture, we are looking at Space Mountain from the outside. If I remember correctly, I took this picture while on the monorail, although it may have been while we were on a bus. The elevation of the shot is what makes me think it was the monorail, though. Space Mountain has one of the best, most recognizable structures in all of Walt Disney World. The look of this attraction is incredibly cool, and even if we don’t get on the ride, I still love to take pictures of it from outside! Space Mountain taken from outside the Magic Kingdom. My friend Amanda from Mouze Kateerz has sent me a photo to share with you, and her shot just happens to be of Space Mountain also. Amanda has this to say about the attraction, which she describes so much better than I did! Space Mountain debuted in 1975 to a Disney World that lacked many exciting roller coaster rides. While the idea of traveling to the moon had lost some of its appeal, the general public still held the idea of traveling to distant worlds very much on the forefront of thought. And here we are nearly 40 years later, still enthralled with the idea of space travel and still very much in love with Space Mountain. I stood in line for Space Mountain many an hour as a child, waiting for hours that seemed endless before the invention of the Fastpass system. My favorite pre-ride sight? You probably remember the huge asteroid that went rolling across the ceiling. I always thought it looked like a Chips Ahoy Cookie. Speaking of Disney journeys into Space…any fans of Disney’s “Black Hole” movie? I loved it, and I still enjoy parts of the soundtrack. I think as a child of the ‘70s, many of my “dark experiences” (Space Mountain, Black Hole, Star Wars, and later E.T. and Alien!!) shaped many of the science fiction loves I have today. Space Mountain is certainly one of my favorite places to photograph: clean lines, iconic architecture, all evoking fond childhood memories. I mainly see it now traveling through the building on the Peoplemover. If you like Disney photography, drop by to see me at Mouze Kateerz on Facebook and Mouze Kateerz on Pinterest. Space Mountain as seen through the eyes of Amanda, the owner of Mouze Kateerz! Next up on my journey of the Disney Coasters is another of the Magic Kingdom roller coasters, in this case, Big Thunder Mountain Railroad. 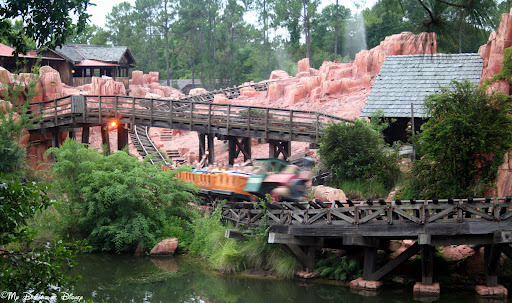 Located over at Frontierland, Big Thunder Mountain Railroad is one of my favorite attractions at Walt Disney World, and I’ve had a lot of success in getting shots of the coaster in action. I hope you enjoy these shots as much as I enjoy taking them! This shot illustrates in one photo what is so incredible about Walt Disney World: the theming. Sure a lot of parks have different themes for their rides, but only in Walt Disney World do you get so immersed in the story that you are able to see all the details that really put you into the setting! I love the fact that there are two mules by the track, and that a possum is hanging from a tree! It really brings home the idea that you are in the wild west on an out of control train! This next photo was taken while we were actually riding on the coaster. I love trying to get shots of things while on an attraction, as long as I don’t do something that is going to take away from the experience for another park guest. As seen from another of the trains! This last shot of Big Thunder Mountain Railroad was taken while we were visiting an entirely different attraction entirely! Can you guess where this photo was taken from? I love how the picture captures the speed of the train as it goes around the curve. So where am I? It isn’t hard to figure out, just leave me a comment and tell me where I was! Next up on our journey around the roller coasters at Walt Disney World is Animal Kingdom, and when you think of Animal Kingdom, you think of Expedition Everest! But before we head there, let me share with you this picture from Primeval Whirl! This picture was taken several years ago when we visited Animal Kingdom. The reason I enjoy this picture so much is because for the longest time Sophie was too small to be able to ride the coaster, and she really wanted to for the longest time! Climbing up to go WAY back in Time! Expedition Everest is a great roller coaster, and I really enjoy taking pictures of the ride! I don’t have any pictures that were taken while on the ride, but I am going to see what I can do to fix that when we’re there next! Another great aspect of Expedition Everest is the ability to take incredible shots with the mountain as a backdrop. 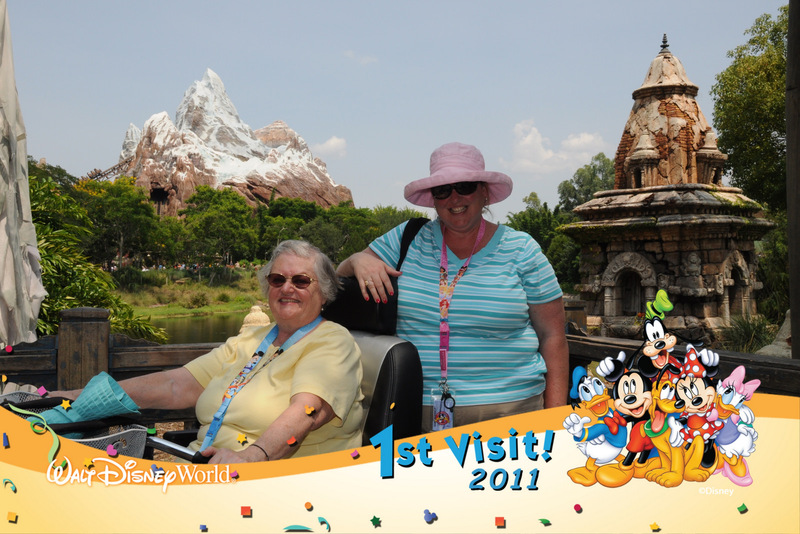 Take a look at this photo that one of the great Photopass photographers took of my sister-in-law and her Mom, who was visiting for the first time last June! The last stop on our journey around the Walt Disney World roller coasters takes us over to Disney’s Hollywood Studios. Somehow, I’ve never taken any photos from inside the attraction, but I love the way they incorporate the musical aspect of the attraction with the coaster, as you can see in these two shots! Rock ‘n’ Roller Coaster Starring Aerosmith Stretch Limo! Thank you so much for taking a journey with me around Walt Disney World! I hope that these shots pique your interest, and if there is any coaster that you haven’t tried yet, I urge you to take a look at them! What is your favorite roller coaster at Walt Disney World? Check out this article I wrote some time back to find out my favorite!